Despite all of the other crazy news that is happening all around the world, the top headlines on Drudge on Monday evening were all about the record heatwave that is currently pummeling the Southwest. Of course it is always hot during the summer, but the strange weather that we have been witnessing in recent months is unlike anything that we have seen since the Dust Bowl days of the 1930s. 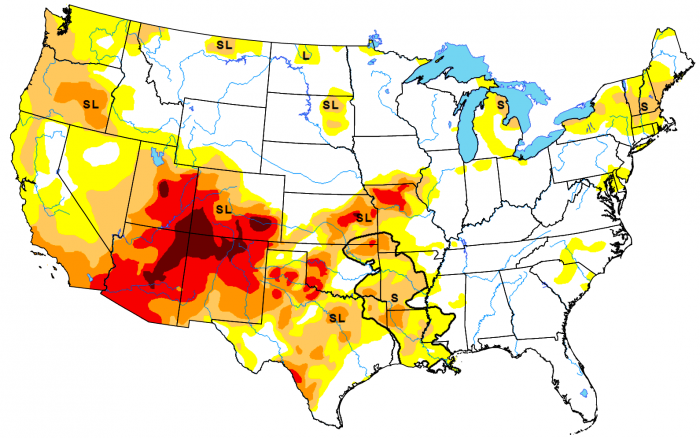 At this moment, almost the entire Southwest is in some stage of drought. Agricultural production has been absolutely devastated, major lakes, rivers and streams are rapidly becoming bone dry, and wild horses are dropping dead because they don’t have any water to drink. In addition, we are starting to see enormous dust storms strike major cities such as Las Vegas and Phoenix, and the extremely dry conditions have already made this one of the worst years for wildfires in U.S. history. What we are facing is not “apocalyptic” quite yet, but it will be soon if the rain doesn’t start falling. ‘We’ve never seen it like this,’ said Simone Netherlands, president of the Arizona-based Salt River Wild Horse Management Group. In May, dozens of horses were found dead on the edge of a dried-up watering hole in northeastern Arizona. Monday was the hottest day on record for Waco as temperatures climbed to 114 degrees just after 5 p.m., according to the National Weather Service. “Officially and by two degrees, this is the hottest it has ever been in Waco,” National Weather Service meteorologist Dennis Cain said. Please keep in mind that a record was not just set for that particular date. 114 degrees was the hottest that it has been in the city of Waco ever. Temperatures approached 120 degrees in parts of the U.S. Southwest on Monday, and forecasters said this week could bring the region’s hottest weather of the year. Phoenix reached a sweltering 115 degrees (46 Celsius), which broke the previous daily record, according to the National Weather Service. From Monday, July 23 to Wednesday, July 25, Phoenix will be under an Excessive Heat Warning. During this time, residents are recommended to stay indoors. With the temperatures rising and ACs on, APS expects record numbers for energy usage. Over in California, the big concern is whether the power grid will hold up or not. California’s power grid operator on Monday issued an alert to homes and businesses to conserve electricity on Tuesday and Wednesday when a heat wave is expected to blanket the state. The California Independent System Operator (ISO), the grid operator, said it issued the so-called “Flex Alert” due to high temperatures across the western United States, reduced electricity imports into the state, tight natural gas supplies in Southern California and high wildfire risk. And that followed a similar alert that was put out by Southern California Gas. It will be very interesting to see if California can get through this current heatwave without any substantial disruptions. The USA is sweltering through what will likely be its hottest May on record, according to a preliminary analysis of weather data. National Weather Service meteorologist Victor Murphy said May 2018 should break the record set in May 1934 during the Dust Bowl. Of course it isn’t just the U.S. that is being affected. Over the past 12 months, we have seen an endless string of record high temperatures being set all over the world. But what should deeply alarm those of us living in the United States in particular is the return of Dust Bowl conditions to the Southwest. Just within the past couple of days, we have seen massive dust storms hit Phoenix and Las Vegas. Very few of us were alive back in the 1930s, but we have heard about the immense devastation that occurred as much of the Southwest was literally transformed into a desert. Well, now it is happening again. Scientists tell us that the Southwest has been unusually wet for the past several decades. For most of human history, the Southwest United States was a bleak, barren desert, and it appears that those conditions may be attempting to return. If Dust Bowl conditions continue to intensify, it won’t just be Arizona, New Mexico, Colorado and Utah that are affected. Agricultural production will be devastated in Kansas, Oklahoma, Texas and other Midwest states as well, and that would have profound implications for the U.S. economy and for the future of our society.